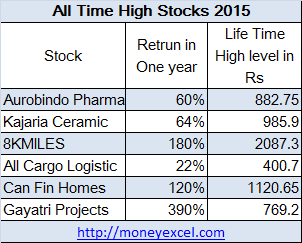 Which are all time high stocks of 2015? Which stocks have good potential for 2016? Before getting answer of this question let’s take a look at the stock market performance of 2015. The stock market was a negative performer in 2015. Benchmark index BSE and NSE had given negative seven percent (-7%) returns in 2015. In negative market also, several stocks were able to outperform and able to touch all time high. 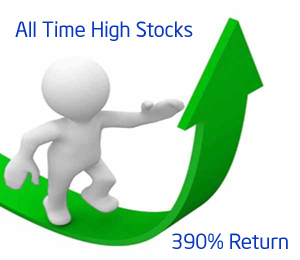 As per latest data from BSE out of 500 stocks, 265 stocks were able to touch all time high in 2015. Out of this 127 stocks were able to perform only after August 2015. As per data available on BSE site stocks like Aurobindo pharma, Kajaria Ceramic, 8KMILES, Allcargo Logistic, Can Fin Homes, Gayatri Projects and Nelcast were able to touch all time high. Pharma Sector Stocks with good earning potential in future are Aurobindo Pharma, Lupin, IPCA labs and Glenmark Pharma. Although Aurobindo Pharma has given good return in 2015 still this stock is having good earning potential in future. Banking sector stocks are the worst performer in 2015. Banking sector stock is expected to give medium or low performance in 2016. However for a long run up to 2-3 years, you can invest in public sector bank SBI, BOB and PNB stocks. In private sector bank, you can invest in HDFC Bank. Infra sectors stock can deliver good return due to upcoming smart city and infrastructure projects. IRB infra, L&T are a good stock in Infra space. IT sector might not perform well in 2016. I suggest that one should stay away from IT stock in 2016. However, if you are planning to invest for the long term you can invest in TCS, Infosys and Wipro. What is your take on mention all time high stocks? Do you think these stocks carry good earning potential?